Tablet Ingredients: Calcium Carbonate (Carrier: Maltodextrin), Bulking Agents: Maltodextrin & Microcrystalline Cellulose, Magnesium Oxide, Tablet Coating (Hydroxypropylmethylcellulose, Hydroxypropylcellulose, Capric/Caprilic Triglycerides, Natural Source Colours [Titanium Dioxide, Iron Oxides], Glycerin), Vitamin C (Ascorbic Acid [Carrier: Glyceryl Tristearate]), Anti-Caking Agents: Silicon Dioxide, Stearic Acid & Magnesium Stearate, Ferrous Fumarate, Zinc Sulphate, Vitamin E (D-Alpha Tocopheryl Acid Succinate) (from Soya), Crosslinked Cellulose Gum, Niacin (as Nicotinamide), Vitamin B6 (Pyridoxine HCl), Betacarotene (Carriers: Starch, Water, Antioxidant: DL-Alpha Tocopherol), Thiamin (Vitamin B1 as Mononitrate), Pantothenic Acid (as Calcium Salt), Vitamin B12 (Cyanocobalamin [Carriers: Trisodium Citrate, Citric Acid, Maltodextrin]), Vitamin D3 (Cholecalciferol [Carriers: Acacia, Sucrose, Corn Starch, Medium Chain Triglycerides, Antioxidant: DL-Alpha Tocopherol]), Riboflavin, Copper Sulphate, Vitamin K (Vitamin K1 [Carriers: Acacia, Sucrose]), Folic Acid (as Pteroylmonoglutamic Acid), Potassium Iodide, Biotin, Sodium Selenate. Allergy Advice: For allergens, see ingredients in bold. If you are breastfeeding a premature baby, please speak to your doctor or neonatal health professional for advice before using this product. Allergy Advice: Made a site that may handle nuts. For allergens, see ingredients in bold. 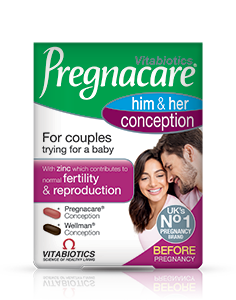 As Pregnacare contains vitamin K, if you are taking oral anticoagulants (blood thinning medication) do not take Pregnacare except on the advice of a doctor. This product contains iron, which if taken in excess, may be harmful to very young children Store below 25°C in a dry place, out of sight and reach of children. Why has Pregnacare Breast-feeding been developed? Why are Omega-3 fatty acids important? When is Pregnacare Breast-feeding recommended? 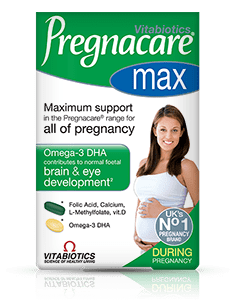 How pure is the fish oil in Pregnacare Breast-feeding? What do I need to know before starting to use Pregnacare Breast-feeding? Can Pregnacare Breast-feeding be used alongside medicines? How many tablets and capsules does one pack of Pregnacare Breast-feeding contain? How and when should Pregnacare Breast-feeding be used? 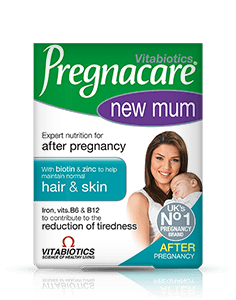 Are there any undesired effects whilst taking Pregnacare Breast-feeding? Is Pregnacare Breast-feeding suitable for vegetarians? Some Nutrient Reference Value (NRV) levels are above 100%. Is this safe during Breast-feeding? 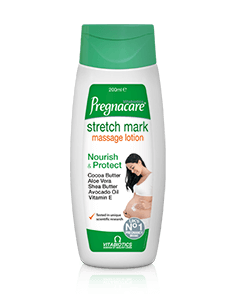 Does Pregnacare Breast-feeding contain Vitamin A (retinol), because excess may be harmful during pregnancy? What happens if I forget to take my Pregnacare Breast-feeding and miss a day? Can i take Pregnacare Breast-feeding before i give birth? 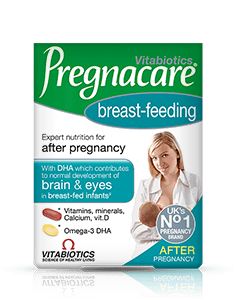 Pregnacare Breast-feeding is a dual pack providing a postnatal micronutrient tablet and fish oil supplement formulated to help support the nutritional requirements of new mothers throughout the postnatal period and while breast-feeding. It provides micronutrients including 700mg calcium and 10mcg vitamin D3, the recommended levels for lactation plus an Omega-3 capsule to provide a rich source of docosahexaenoic acid (DHA) as maternal intake contributes to the normal brain and eye development of breast-fed infants**. These fatty acids are passed to the baby via breast milk and helps in the development of the baby's brain and eyes. Pregnacare Breast-feeding provides 300mg DHA, the level recommended by international experts*. Pregnacare Breast-feeding is recommended after childbirth to help safeguard your nutritional needs during the postnatal period. During breast-feeding, there maybe extra nutritional demands placed on your body and intake recommendations of certain nutrients maybe increased whilst lactating. YOU DO NOT HAVE TO BE BREAST-FEEDING TO USE THIS PRODUCT, AS IT IS IDEAL FOR ALL NEW MUMS. The formula will also help new mums following pregnancy as a general postnatal supplement following pregnancy to replace depleted nutrients. Only the purest pharmaceutical grade fish oil, has been used in Pregnacare Breast-feeding capsules. To ensure maximum benefit the oil is carefully concentrated to increase its DHA and EPA content and further purified. Each batch is rigorously tested, certified, and fully compliant with stringent EC and WHO rules on environmental pollutants. Pregnacare Breast-feeding has been carefully developed by a team of medical experts including highly qualified pharmacists and medical consultants, and is based upon solid scientific research evidence, as a nutritional safeguard for women after pregnancy whilst breast-feeding. 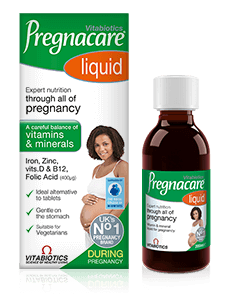 Pregnacare Breast-feeding replaces your usual daily multivitamin. As a general rule, Pregnacare Breast-feeding can be taken alongside medications because it contains only moderate levels of vitamins and minerals. However, if you are already taking prescribed supplements or medications, seek advice from your doctor or health professional first. As Pregnacare Breast-feeding contains vitamin K, if you are taking oral anticoagulants (blood thinners) do not take Pregnacare Breast-feeding except on the advice of a doctor. Pregnacare Breast-feeding contains 56 postnatal micronutrient tablets (two per day) and 28 Omega 3 DHA capsules (one per day). Two tablets and one capsule per day is recommended with or immediately after your main meal, with water or a cold drink. Taking Pregnacare Breast-feeding with a large meal maximises the absorption of the nutrients, and can reduce nausea which is sometimes experienced if supplements are taken on an empty stomach. Pregnacare Breast-feeding should only be taken on a full stomach. Always ensure that Pregnacare Breast-feeding is taken with plenty of liquid to wash down the tablet and capsule. We do not recommend chewing the tablets or capsules because they have not been formulated as chewable preparations. Pregnacare Breast-feeding has no known side-effects when taken as directed. Do not exceed the recommended tablet and capsule intake. In case of overdose, seek medical advice immediately. No. 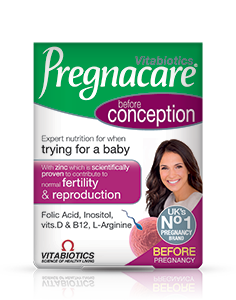 Pregnacare Breast-feeding is not suitable for vegetarians as it contains a fish oil capsule. Adults can obtain DHA and EPA indirectly through the conversion of the essential fatty acid alpha-linolenic acid (ALA), present in vegetable oils such as flaxseed but this process is very inefficient. Pregnacare Breast-feeding contains fish oil as it provides a much more reliable, direct source of DHA and EPA. The foetus and infant in early life need to receive these fatty acids directly as they only have a limited capability to convert essential fatty acids to more active long chain fatty acids such as DHA. NRV levels are calculated to help prevent the most basic vitamin and mineral deficiency states. The levels contained in Pregnacare Breast-feeding are specific to normal requirements whilst lactating. This is why some levels of nutrients in Pregnacare Breast-feeding are higher than the NRV (e.g. Vitamin D, the recommended level is 200% NRV). Importantly, all levels are safe and well within upper safety guidelines for daily self-supplementation. 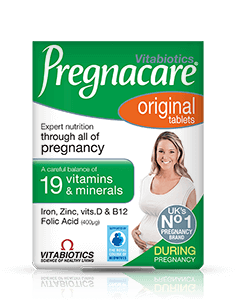 Pregnacare Breast-feeding does not contain any vitamin A either in the multivitamin tablet or the special fish oil DHA capsule. The multivitamin tablet has been carefully formulated specially for pregnancy to contain a moderate (non-excessive) level of betacarotene (provided as natural mixed carotenoids) instead of vitamin A. Betacarotene (pro-retinol) is converted into vitamin A naturally by body as required, and is safe and suitable for pregnancy. 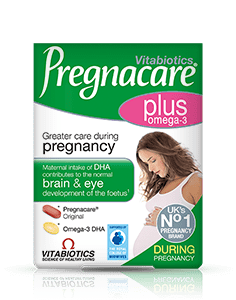 The Omega 3 capsule in Pregnacare Breast-feeding is produced from fish oils that are certified free from Vitamin A and therefore safe to take throughout pregnancy. A regular intake is recommended, but don't worry, this will not have done any harm. Simply take Pregnacare Breast-feeding on the next day when you remember, and take as directed. You should not take more than the recommended amount on subsequent days to make up for any day(s) that you have missed. Whilst it is important to take a supplement every day, if you miss one day this is fine because the beneficial effects of the vitamins and minerals build over time. 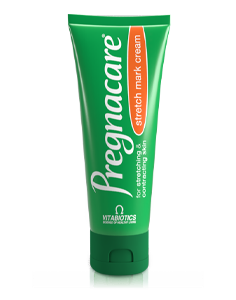 Pregnacare Breast-feeding can be taken during pregnancy if required as you change over from Pregnacare, Pregnacare Plus or Pregnacare Max. It does not matter whether the day you change over to Pregnacare Breast-feeding is before or after giving birth. The usual advice for those who have difficulty in swallowing tablets, is to break the tablets into 2-3 pieces, before swallowing with plenty of liquid. For capsules (which contain liquid), and in cases where people have more difficulty in swallowing tablets we recommend after chewing some food (e.g. banana), just before you swallow, pop it into your mouth and swallow it together with the chewed food, followed by some liquid. The throat opens up wider automatically to swallow the chewed food and hence it should go down with greater ease. Alternatively the tablets or capsules may be swallowed with thicker liquids such as yoghurts or smoothies. We hope these tips are of help.